Motorcycle Accident Lawyer Seminole FL | DeLoach, Hofstra & Cavonis, P.A. In Pinellas County Florida, we enjoy almost year-round beautiful weather. This makes riding a motorcycle around the St. Petersburg area a very popular place to travel. 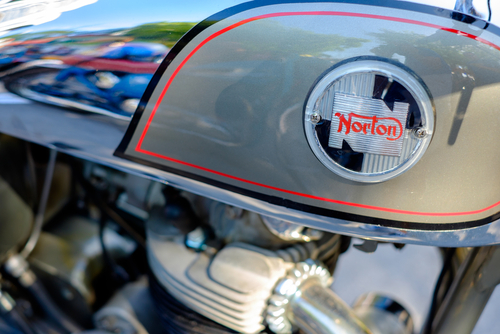 However, the consequences of a Florida motorcycle accident can be catastrophic. When a motorcycle and a car collide, it is almost always the motorcyclist that is injured or killed. Over the last 10 years, the number of motorcycle registrations have doubled. This increase in registration coincides with the number of accidents. The proportion of motorcycle fatalities compared to all traffic fatalities in Florida has reached an all time high of 17.8 percent. 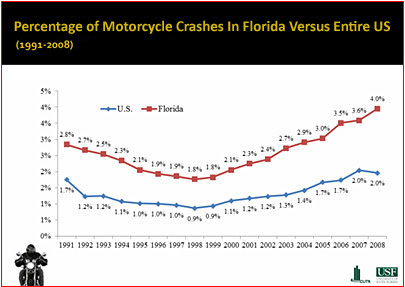 Between 1991 and 2008, Florida has steadily experienced a significantly higher number of motorcycle accidents than the average number of motorcycle accidents in the US. It is important to work with a Pinellas County area motorcycle accident lawyer who has successfully represented motorcycle injury victims to get the full compensation they deserve. Our personal injury attorne yhas the knowledge and experience you need. Even though all vehicle accidents can be awful, the most horrifying injuries tend to be associated with motorcycle accidents. Motor accidents are the leading cause of death between 6-33 year olds in the United States. When it comes to motorcycle accidents, about 3,000 cyclists are killed every year. In most situations, those that are not killed, are seriously injured. Statistics show that in most cases, these motorcycle accidents are not actually the fault of the motorcyclist, but instead of the driver of the car, van, truck, or other vehicle. There are situations where the other driver was simply unable to see the motorcycle; however, according to the law, this does not excuse them from culpability. Get personal information from the drivers involved and all witnesses including their names, addresses and phone numbers. Remember the police don't always interview every witness. Note all license plate information as well as the year, make and model of the vehicles involved. Also get their insurance information. Preserve the scene and evidence by taking pictures of the vehicles, the area, and any visible injury you have. Don't speak with anyone other than law enforcement. Statements made to the police are not admissible in Court, but your statements to anyone else at the scene are. Immediately get your injuries treated by medical professionals. Speak to a local Pinellas area motorcycle accident attorney. Being involved in a motorcycle accident typically results in severe shock, so there may be injuries that are not immediately noticeable. Therefore, do not use this apparent lack of injury as an excuse to delay getting medical attention immediately, as this will be essential to filing compensation as a result of your accident. Likewise, wherever possible try get witness statements, file your police report straight away, and get all of the relevant details from the other driver. Doing these things will prove very useful when you claim for compensation for the injuries and damages from the motorcycle accident. Of course, this may not always be possible, as the accident could result in too serious an injury or unconsciousness. Motorcycle accidents often result in very serious injuries or death, and it is important for those involved in an accident to contact an experienced attorney in order to recover full compensation. It is crucial that you get the right attorney to assist you in this process, as your choice now determines the effectiveness of your claim and will affect the outcome of your case. Our lawyer, Paul Cavonis, can evaluate all of the facts surrounding the accident in order to get you the maximum amount of compensation possible for your motorcycle accident injuries. We will be looking to get compensation for mental or physical injuries, property damage, loss of earnings, medical expenses, and any other damages resulting from the motorcycle accident. As a motorcycle rider you must share the road with drivers who aren't necessarily looking out for you. If you have been injured while riding your motorcycle, you are dealing with unexpected medical costs and you may even be missing work. You don't need the added stress of bills from an attorney. At DeLoach, Hofstra & Cavonis, you are not responsible for any of our fees or costs unless there is a recovery. We will advance all of the costs necessary to aggressively pursue your claim. We will never ask you to pay any of these costs out of your own pocket. Call us day or night at 727-397-5571 or send our motorcycle accident lawyer an email. I'm Attorney Paul Cavonis and I'm a motorcycle accident trial attorney. As a rider myself, I am passionate and dedicated to protecting the rights of motorcyclists who've been injured or killed in motorcycle accidents. I started riding motorcycles when I was 10 years old and haven't stopped since. I've been to Alaska, Key West, and everywhere in between on a motorcycle. I've logged over 200,000 miles on everything from Harleys to Honda dirt bikes and currently own a Harley Electra Glide, several Triumphs and Honda dirt bikes. I'm a lifetime member of the AMA. I've also suffered a very personal loss as the result of a negligent driver. My brother was killed by a driver making an improper left turn, a major hazard to all motorcyclists. For me, representing injured motorcyclists is more than a job. Why should this matter to you? As a rider you understand the complexities of the operation of a motorcycle, the unique way a motorcycle reacts to steering, throttle and braking inputs. You also understand the special hazards faced by riders and the importance of things like lane positioning and counter-steering. The question is whether your lawyer understands these things too. As a life-long rider, I understand. Before you hire a lawyer, don't just ask about their legal qualifications. Ask if they have any real experience operating a motorcycle. Ask if their experience is limited to sitting on a bike so their picture could be taken for an advertisement. You probably wouldn't hire a lawyer that has never driven a car to represent you in a car accident, so why would you hire a lawyer that has never operated a motorcycle to represent you in a motorcycle accident?